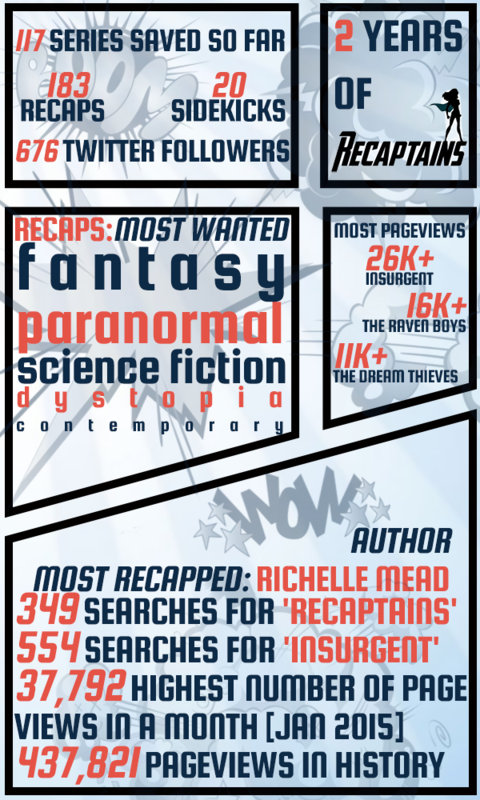 Two years ago today we first went live with the Recaptains. At this point, we had been planning and plotting for weeks, writing our first recaps and working on the design and figuring out how, exactly, we wanted to do this thing. Because if we were to do this, to really do this, we wanted to do it right. And I think the fact that we’ve been around for two whole years kind of shows that we did at least something right. Recaptains started out on Twitter with a conversation between Betty, Hannah, Judith, and Amber, and in two years it has quickly expanded to become an incredible force (in our opinion). We have Betty and Judith to thank for the original idea, Amber to thank for being awesome and coming up with the name, and Hannah for encouraging the craziness and offering to help out. Shortly afterwards, we gained some new teammates! The ever-so-awesome Sana and Fahima joined the team, along with Ula and Sarah who are no longer recapping with us. These ladies, along with all of our amazing followers, visitors, and contributors, have been absolutely wonderful these past few years and have been absolute life-savers. Thank you to everyone who has supported our little website in the past two years, especially those who have been with us since the beginning. We’re thrilled to have hit the two year mark, and we hope to continue fighting evil for many years to come! As you can imagine, saving the world is a lot of work, especially since we’re all in work, school or university. As of today, the four of us will be on the look out for some new superhero friends to join the team! Submissions will stay open as long as necessary, until we find the right people to become official superheroes with us. If you think you have what it takes, just fill in the form below!